When we cut an onion, its cell walls get torn and release an enzyme called Lachrymatory-factor synthase into the air. 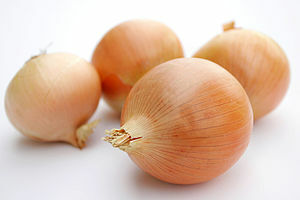 The synthase enzyme converts the sulfoxides (amino acids) of the onion into sulfenic acid. The unstable sulfenic acid rearranges itself into syn-propanethial-S-oxide. Syn-propanethial-S-oxide gets converted into sulphuric acid when exposed to oxygen in the air. Now, when the acid comes in contact with our eyes, the lachrymal glands get irritated and produce tears. So, the secret to a pleasant onion-chopping experience lies in reducing the amount of sulphurous gas released into air, either delaying its release or diluting it and protecting our eyes from its impact. Though there have been numerous methods revealed by experts around the world to combat this problem, I would like to state the most easy and practical ones here. Leave the root end intact till the last cut as this is where the synthase enzyme is most concentrated. Use a very sharp knife and cut quickly. This crushes less number of cell walls and causes a minimal amount of the gases in the onion to be released. Chill the onion in the refrigerator for ½ -1 hour before you slice it. The cold temperature slows the movement of atoms in the gas so that they do not float up into the air so quickly. Cut the onion into half, peel the outer skin, rinse it in running water and then cut. This dilutes the gas before it floats into the air. If they are shallots, soak them in a bowl of water for ½ hr and then cut them one by one. Wave bye to tears caused by onions with any of the above methods. It is also a solace to know that even without taking all these precautions, some species of onions provide us with a tear-free cutting session!!! Yes, the Vidalia from Georgia, the Walla Walla from Washington and the Maui from Hawaii are mild varieties that have higher sugar content because of the soil and climate in which they grow. These varieties do not irritate our eyes and are user friendly. Posted in Veggies and tagged Eye-stinging onions, Lachrymatory-factor synthase, Onion, Onion cutting tips, sulphuric acid, Syn-propranethial-S-oxide, Vidalia onions, Walla Walla onions. Bookmark the permalink.